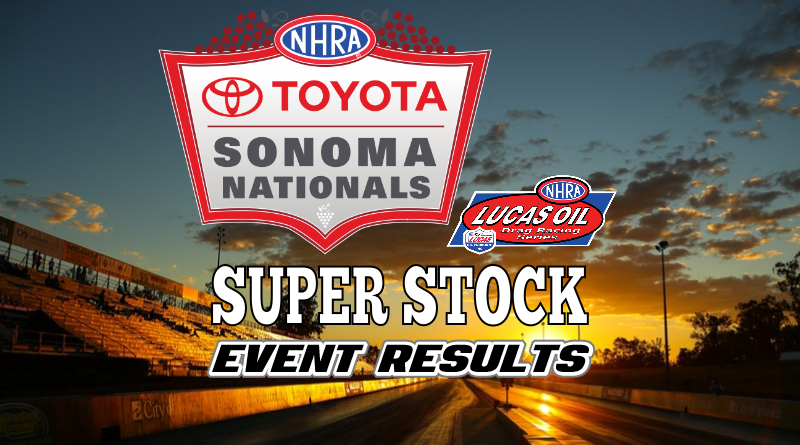 SONOMA, Calif. – Longtime Super Stock racer Don Keen of Palmdale, California picked up his fifth national event win at the NHRA Toyota Sonoma Nationals. Keen collected the Wally with a final round win over Mark Kirby of Bakersfield, California. Keen, in his ’65 Ford Mustang, was appearing in his eighth national event final round. After first round opponent Michael Ogburn fouled in his Hemi ‘Cuda, Keen narrowly survived his second round contest with Mike Graham. Keen left captured a .022 to .123 reaction time advantage over Graham but almost gave away the race at the top end. Keen took a train length at the finish (.013) in running dead-on his dial. Keen killed about .02 at the stripe to go 10.331 on his 10.33 dial-in as Graham trailed him by 25 feet at the stripe. After surviving round two, Keen met Tony Hewes in the third round. Keen had a terrific .007 light and picked up the win with a 10.305 on his 10.28 dial. Hewes made a solid run but his .022 initiated .05 over-the-dial pass was no match for Keen’s .032 package. Keen came out on the winning side of the fourth round break-out contest with Rodger Comstock. With only .009 separating them at the tree, the race would come down to who drove the finish better. Keen’s all-out .042 over-the-dial run was ultimately enough for the win after Comstock took .059 at the stripe to go -.008 under his dial. For some reason Comstock dialed up about .05 for this run. Although he was able to kill about .06 at the stripe, he was still a little quick leading to the loss. With the win, Keen received the bye run in the semifinals. Mark Kirby drove his ’71 Plymouth to his second national event final. Kirby picked up an easy first round win when opponent Douglas Colley ran well off his dial. In the second round, Tod Haste fouled giving Kirby a free pass to the third round. After an even start, Kirby took just .004 at the finish line to turn on the win light over Alan Freese. Although Kirby looked to be running dead on his dial, he killed about .03 to take the razor-thin margin of victory. After a fourth round bye, Kirby faced Jon Irving in the semifinals. After both drivers killed the tree, .009 for Kirby and .012 for Irving, Kirby pulled out the victory with his all-out 10.254 E.T. on his 10.25 dial. Irving broke out in the loss running .038 under his 10.45 dial-in as he was not able to kill the .05 he was holding. After taking a .021 to .032 advantage at the start, Keen’s Mustang drove to the win with an all-out 10.315 E.T on his 10.31 dial-in. Kirby took just .002 at the finish but broke out by .008 in doing so. The key to Don’s win was his Mustang’s performance. During eliminations, the car was on either a 10.31 or 10.32 pass in every round. Pretty impressive when you consider all the different days the Super Stockers race in addition to the ever-changing track and weather conditions. Congratulations to Don and his classic Mustang on their latest national event victory!